GAITHERSBURG, Md. 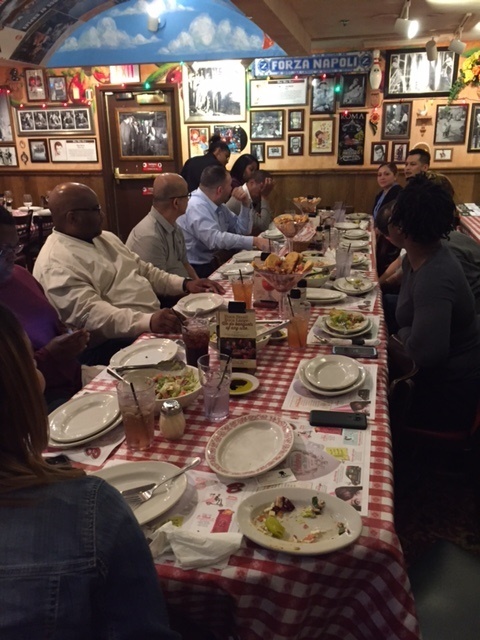 (March 17, 2017) – Wounded Warrior Project® (WWP) veterans recently gathered for dinner and discussed the civilian career world with members of WWP’s Warriors to Work® program. Beyond receiving employment counseling and resume guidance, warriors experienced the benefits of connecting with fellow service members in their communities. Over a casual, family-style meal, veterans and guests learned about helpful resources available through WWP career counseling. WWP staff assisted veterans with developing career blueprints and highlighting military-honed skills on their resumes. Through this service, warriors are able to translate their skills and work ethic to civilian opportunities. The lucky recipients of these resumes are local employers and veteran-friendly national organizations. Hiring veterans in the civilian workforce gives organizations highly coachable team players with specialized skill sets, who are an asset to any team. Army veteran Leonard Vargas attended the dinner – not as a potential job-seeker, but to connect with local warriors and provide his story as living proof that the program is successful. Warriors and WWP staff discussed the importance of maintaining a sharp resume and the power of social and professional networking among military peers. The program is more than just a source of manpower for organizations that want to enhance their teams with veterans. It educates potential employers about combat-related injuries and reasonable accommodations. This is key for developing a long-lasting relationship throughout employment. Learning about these topics attracted Army veteran Khalil Alotaibi to the dinner. Army veteran Thierry Atangana arrived at the dinner – his first WWP event – eager to connect with warriors who understood him. These connection activities support the long-term recovery needs of warriors by reintroducing them and their families to the bonds experienced during military service. In a WWP survey of the injured warriors it serves, more than half of survey respondents (51.7 percent) talked with fellow veterans to address their mental health issues. WWP’s career counseling staff also guided Thierry with advice for his journey to the world of civilian employment. WWP offers a variety of programs and services that assist injured veterans with mental health, physical health and wellness, career and benefits counseling, and connecting with other warriors and their communities. Generous donors make it possible for wounded warriors to take part in outreach activities and benefit from program resources at no cost to them. Warriors can access beneficial Warriors to Work guides online, including financial planning assistance and tips on managing expectations when attending civilian job fairs. When a warrior connects with a WWP staff member, more in-depth help is available. To learn more about how WWP’s programs and services connect, serve, and empower wounded warriors, visit http://newsroom.woundedwarriorproject.org/.